This story won the CNN MultiChoice African Journalist Awards 2016 in Culture. “I often wonder how musicians with the gift of sight manage to coordinate so many things at the same time: they have to look into the score, at the conductor and play instruments. To me it sounds like a very difficult task, demanding enormous concentration. When I play I am totally immersed in the music and only the music. Or maybe it’s just different for people who see and those who don’t…” says Shaimaa Yehia, the visually impaired violinist in the Al Nour Wal Amal Orchestra. Shaimaa adds that many sighted musicians she has encountered in the course of her career have often responded to her wondering about this; they explain that “it all depends on the way one is taught, perceives and practices music. There is no difference between sighted and blind musicians. Music will always be there; it’s about how you concentrate, how you direct your focus,” Shaimaa reports them saying. She tells me more about her love of classical music and how it always speaks to her, triggers her emotions, soothes and intrigues her, and how when she was eight years old she was fascinated by the violin’s sound and began her creative journey at the Al Nour Wal Amal music institute. Her many memories and experiences are embedded in music. She points to challenges and thrills she finds in Johann Strauss’ The Blue Danube, delights she has uncovered in Béla Bartók’s Suites for Orchestra, unique encounters with Beethoven, the joy she gets from Tchaikovsky’s Nutcracker. She talks about her fascination with Mozart, a composer who “gives great importance to all strings, brings the best out of the first and second violins, with the latter ones carrying the most fascinating melodies,” as Shaimaa, who plays second violin, puts it. Today in her early 30s, Shaimaa’s journey with music has become her life story, which in many ways resembles the stories of over 40 other members of Egypt’s unique orchestra, consisting of visually impaired and completely blind women: the Al Nour Wal Amal (or Light and Hope) Orchestra. The orchestra operates under the umbrella of an association of the same name established in 1954 by a group of volunteers under the leadership of the late Istiklal Radi. The first of its kind in the Middle East, the Al Nour Wal Amal Association aims to provide care, education, vocational training and social integration opportunities for blind girls and women. 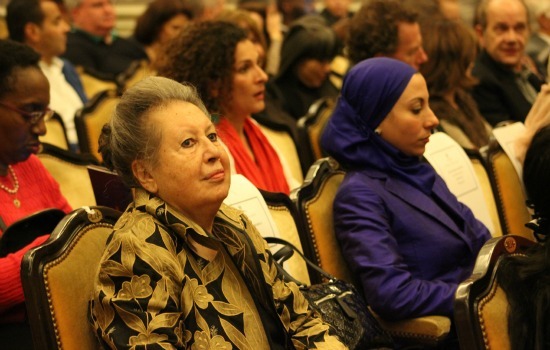 In 1961, the association opened a music institute whose pillars were built by the late Samha El-Kholy, former president of the Academy of Arts and former dean of the Cairo Conservatory. The orchestra, which started coming to light in the 1980s, is the music institute’s most prominent outcome. Today, the institute staff consists of musicians and professors from the Cairo Conservatory, the College of Music Education of Helwan University and the Cairo Symphony Orchestra. For two decades, the orchestra was trained and conducted by the late Ahmed Abul Eid, then maestro Aly Osman took over. At the same time, a smaller orchestra for younger student musicians is led by Mohamed Saad Basha. Throughout the past decades, thanks for the most part to the unprecedented efforts of the Al Nour Wal Amal Association’s vice-president Amal Fikry, the orchestra has built a strong reputation in Egypt and internationally. Since their first visit to Austria in 1988, the musicians have travelled across five continents to dozens of countries. Their repertoire includes western classical music compositions topped with a few works by renowned Egyptian and Arab composers, among them Abou-Bakr Khairat, Rageh Dawood, Riyad Al-Sonbaty and Aly Abdel-Sattar. In all its concerts, whether in Egypt or abroad, the orchestra performs symphonic works, rarely stepping beyond this format. And so their latest cooperation in the performance of Days and Nights of the Heart Tree (Les Jours et les Nuits de l’Arbre Coeur) by the French-Algerian writer and composer Tarik Benouarka – a composition that incorporates two voices, soprano (Dalia Fadel in Cairo and Rasha Rizk in Paris) and tenor (Ragaa El-Din), choir and a narrator – was definitely a new experience for the visually impaired musicians. Days and Nights of the Heart Tree premiered in Egypt on 30 September at the Cairo Opera House. It was then performed at Paris’ prestigious Salle Gaveau on 5 November. Usually, Aly Osman accompanies the women on their travels, but this time it was Mohamed Saad Basha who joined the orchestra. Once again, in Paris, the Al Nour Wal Amal Orchestra was applauded generously by the audience who stood up in recognition of the effort and delivery of the music by the visually impaired ladies. 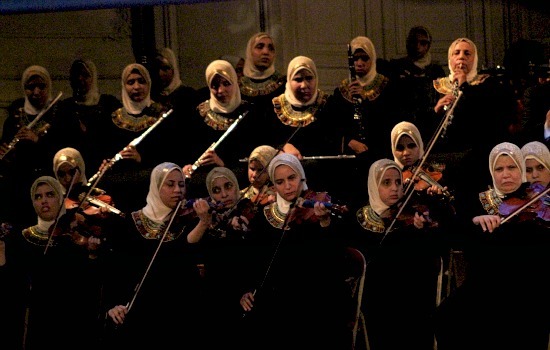 Though it seems that, wherever they go, the Al Nour Wal Amal orchestra are showered with ovations – no wonder they have been called “the fourth pyramid of Giza,” “the human miracle” and “the ambassadors of Egypt” by audience members and critics alike – for the women of Al Nour Wal Amal, music is not limited to accumulating success. It is an enriching life journey, both collective and individual. “Music is energy and power,” the 24-year-old Heba Raafat, a clarinetist of the Al Nour Wal Amal Orchestra, tells me. The time I spent with the fraction of the orchestra that travels, whether recently in Paris or two years ago in Berlin and Hamburg, allowed me to approach those wonderful ladies and look at their world, which turns out to be no different from that of sighted musicians. Yet, as if the impairment gives them a different kind of strengths, at times more pure and truthful, maybe the world of Al Nour Wal Amal still cherishes values which others ignore or take for granted. The self-motivated musicians express unconditional gratitude for what they have achieved and on many occasions underline their joy and pride in being part of a wonderful project. 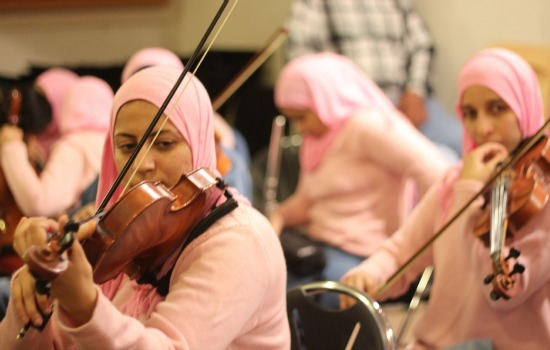 Al Nour Wal Amal is not just an orchestra, their lives in it are intertwined with each other and with the music, with relationships developing at the institute and beyond. Whether during rehearsals, on a bus or plane, chitchatting down a hotel’s corridor or at the restaurant, the link between them is very apparent; they are always aware of each other’s presence and particularly sensitive to one another’s behaviour and needs. And even if minor skirmishes arise here and there – a natural part of life – the understanding between those special musicians expands beyond music and is evident in all their activities. Music enriches the lives of all the girls and women playing in Al Nour Wal Amal, but it would be wrong to think they hide in music to escape from their impairment. Though naturally many ladies rely on support from sighted people, none of them sees herself differently as they lead very dynamic lives. Having completed their education at the association, they pursue their studies at university, work, start families, while their impairment only encourages them to do their best. For them music is not only a passion but also and a serious responsibility. Shaimaa tells me that, though the orchestra is always acclaimed, especially in the western world where the cultural connection with classical music is stronger, the musicians always ask for an honest criticism. Nagat Radwan, the executive manager of the Al Nour Wal Amal Orchestra, has been working with the girls for over 25 years. Radwan refers to thousands of children in Egypt who have different disabilities resulting from marriages within close family members. She adds that, though many doctors warn parents, the customary wedlock continues to be practiced and even when the children, one after the other, are born differently abled, the parents do not seem to take action. Shaimaa and Heba are the only visually impaired children in their families of many siblings, yet flautist sisters Rasha Ibrahim and Aida Ibrahim are among three blind children in a family of five. Conversations with musicians reveal dozens such examples. It becomes clear that, since many of the impaired cases in Egypt are linked to the most underprivileged communities, many families either do not realise early enough that their child might have a problem or are incapable of providing the required medical help, which in some cases can prevent blindness. The reasons behind impairment may vary and while many triggers are to be specified by the geneticist and physicians, social and economic factors obviously play a role in the condition’s development. 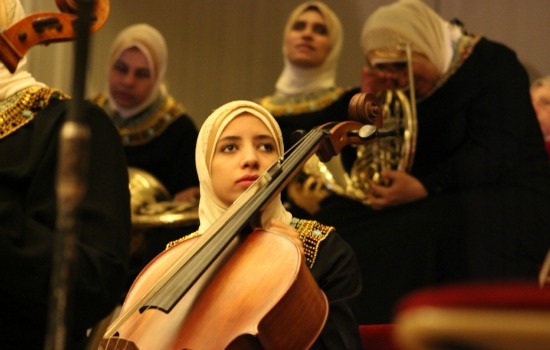 But, impairment aside, many musicians in the Al Nour Wal Amal Orchestra are typical representatives of Egyptian society, a social stratum struggling with financial, traditional and social limitations. Just like a big chunk of the society, their lives are not always a bed of roses. As much as they are enriched with art, one would expect that since they play music that is culturally distant from the musical tastes of the community they live in, this fact would create additional challenges. My discussions with several musicians revealed that even if many musicians’ parents have no interest in western classical music, they still encourage their children to be active members of the orchestra. The musicians themselves enjoy western classical music as well as compositions by Egyptian and Arab composers. Rasha points to many composers she loves, placing the names of Mozart, Beethoven, Tchaikovsky at the top of her list. “I still enjoy works by Arab composers, though undeniably western classical music has its own charm. I feel that sometimes in Egypt we do not find a place for our music and no doubt people understand us better outside the country. This does not mean that we are not appreciated in Egypt as well; our families still attend the concerts and encourage us.” She adds that most of the musicians are very active and find support in their parents when choosing music as hobby or professional life path. The situation, however, becomes more challenging when the girls are engaged or married and their partner influences – or at times imposes – his view on musical practice or work in general. Rasha is married, the mother to two children (aged one and five). She says that her husband supports her playing music and two days of practice a week at the music institute do not interfere with her regular home responsibilities. At times she brings her son Reda to rehearsals and hopes that he might study music or play the violin. “I hope it will be feasible,” she adds. Some women in the orchestra also work at the association, such as clarinetist Heba, who assists in copying musical scores in Braille at the institute’s library. She says that her fiancé encourages musical practice, her participation in the orchestra and travels. “My parents were always very supportive, and my fiancé knows how much music and my work with Al Nour Wal Amal means to me. My fiancé would not stand against this; he knows whom he chose to marry,” she states. Shaimaa, still single, is very active. Apart from playing the violin, she teaches English at the institute and enjoys a dynamic schedule. “I can’t imagine becoming static or staying at home. I have to remain active and involved in many projects. In fact I used to be much more timid; travelling and exposure to many cultures have allowed me to become more social,” she explains with her trademark enthusiasm. 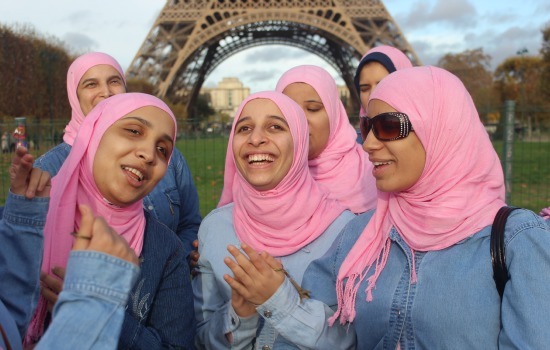 Like many other women, Heba, Shaimaa, Rasha and her unmarried sister Aida all manage to participate in the association’s activities and pursue their lives as musicians. But the situation is not so simple for everyone. Though cellist Doaa Magdy’s parents appreciated her playing in the orchestra, when she got married, she moved to Banha, a city located 50 km north of Cairo, and eventually withdrew from Al Nour Wal Amal. “My husband didn’t want me to stop playing, he loves music; but when our daughter was born, my travels to Cairo and back started affecting her,” Doaa mentions repetitive health problems of the small girl, whom she had to take with her to each rehearsal. Though she hopes to return to music in the future, she is also aware that in the upcoming years her family will only grow. Radwan points out another, more extreme example of Maha, a musician who got married and though at first her husband didn’t mind her continuing with the orchestra, soon he asked her to stop playing, wear the niqab and stay at home. “When such problems arise, we often try to resolve them with the musician’s family. Sometimes it works, but unfortunately there are also instances when the girls drop music altogether,” Radwan explains, adding that Amal Fikry, the association’s vice-president, not only makes sure that the institute provides the musicians with the best education available but also acts as mother to all the girls, supports them emotionally, even financially, listens to their problems and finds solutions for many. “Mrs Amal is the backbone of the Al Nour Wal Amal Orchestra. She is the dynamo of everything we do, she takes care of us, arranges our travels so we can perform in other countries and get to know other cultures,” Heba comments. Her appreciation and love of Fikry is shared by other women. Heba expresses strong disappointment in the fact that though the institute is supported by a few bodies, it is not enough. These views are shared by each and every girl, as well as Nagat Radwan. The values sustained by the Al Nour Wal Amal Association, the music institute and the orchestra are countless, and reminding readers of their multilayered importance to society would be redundant. We can only hope that the worries expressed by the musicians and the Al Nour Wal Amal staff will find a remedy. Maybe, the recently signed protocol between Al Nour Wal Amal Orchestra and the Cultural Development Fund, a body operating under the Ministry of Culture, will help to alleviate the pressure. The details of the cooperation are to be announced in the near future.